Sunday marks one year out from the Iowa Caucuses and the Democratic field is already getting crowded. 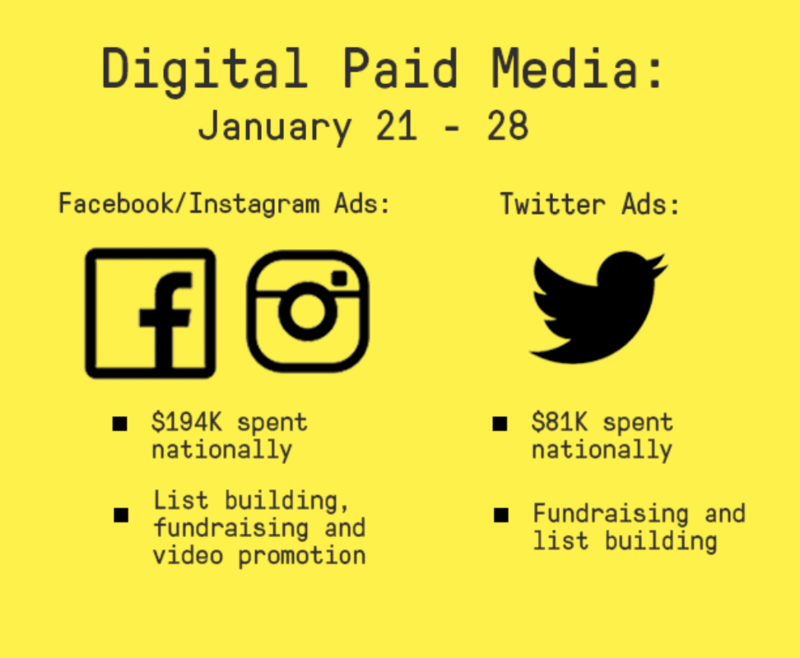 This week we looked at what a modern campaign launch looks like – and how campaigns can leverage digital media, traditional communications and in-person events to make the biggest splash. 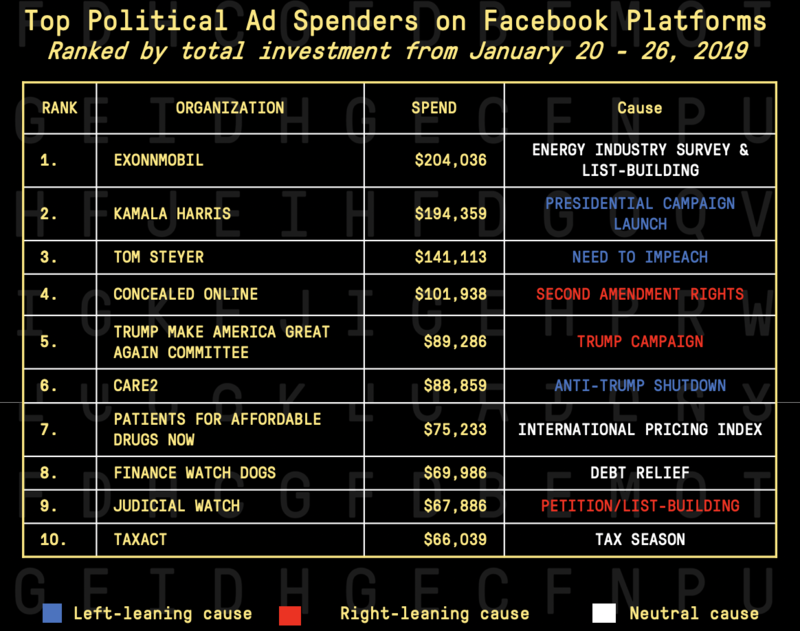 Among the Democratic presidential candidates, Kamala Harris shot to the top of the list of Facebook investment last week. 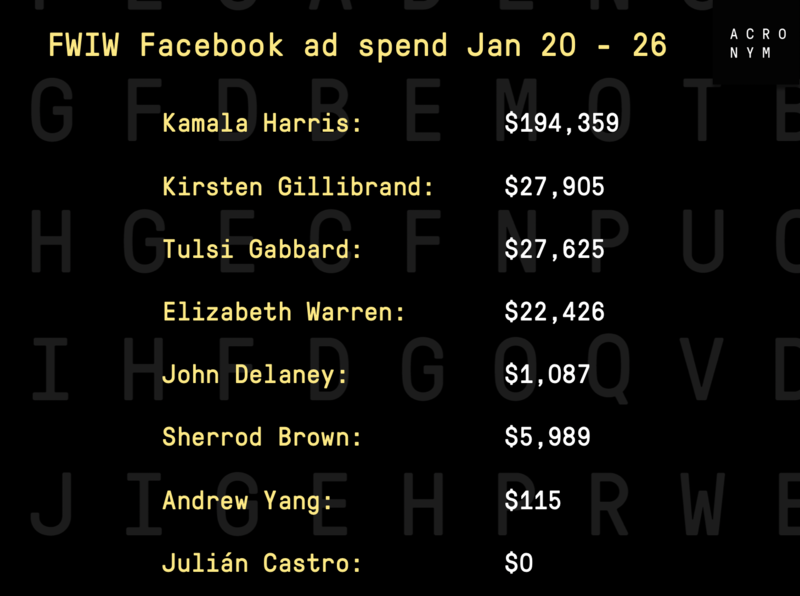 During the week of her campaign’s launch, she spent more on Facebook than all other Democrats running for president (plus Sherrod Brown’s America Works tour) and Donald Trump’s campaign combined. Morning shows…late night shows…rallies…roundtables. 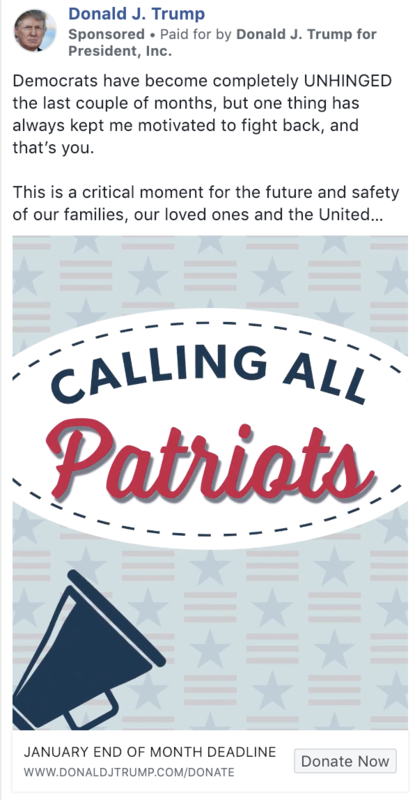 There are endless options for how a candidate can launch his or her presidential campaign in 2020. And we’re seeing nearly all of them play out across the Democratic primary field. 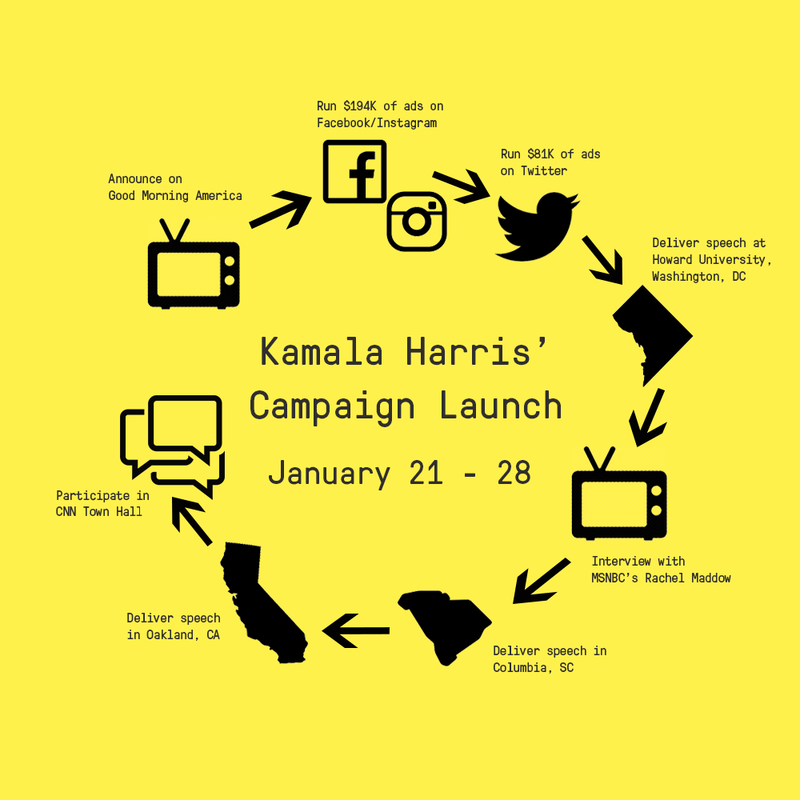 This week, we looked at Kamala Harris’ launch of her presidential campaign – and how she leveraged multiple mediums and strategies – both online and offline to maximize impact not just for one day but for the week following her announcement. 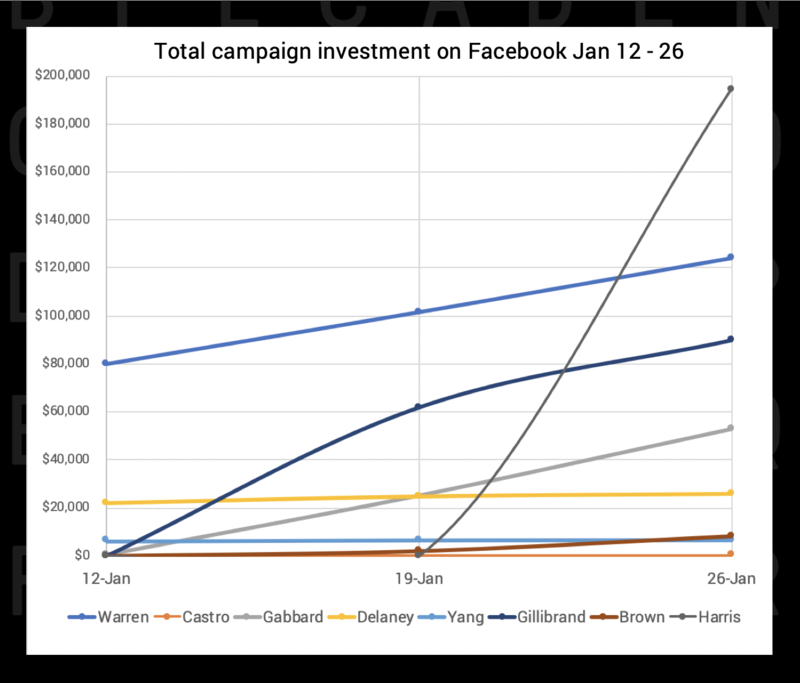 Harris’ campaign put the largest focus on digital investment to amplify her campaign launch than any other Democratic presidential contender so far. 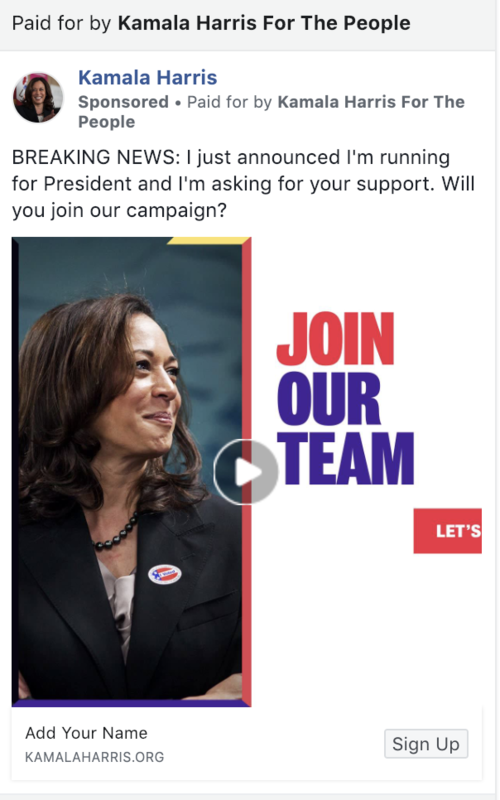 In conjunction with her official announcement on Good Morning America, Harris’ campaign invested over $194,000 on Facebook and Instagram ads alone from January 21 – 26. On Twitter, Harris’ campaign spent an additional $81K that same week. 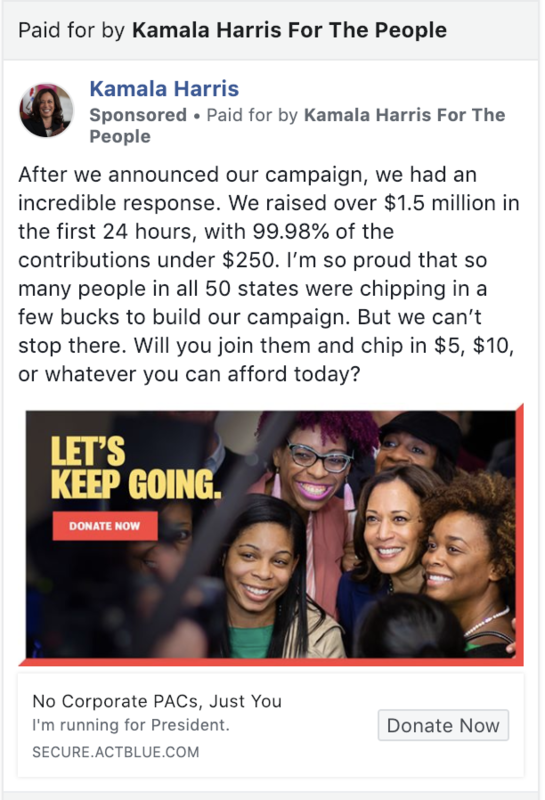 The ads ran nationally and focused on list building, fundraising, and amplification of Harris’ campaign launch video. In just over a week since Harris’ announcement, her launch video has been viewed on YouTube over 334,000 times, but it still trails views of Elizabeth Warren’s campaign launch video, which now has almost 1 million views on YouTube. While we couldn’t find any information on Google’s Transparency Report on whether Harris’ campaign is advertising on Google or YouTube, Warren has spent nearly $50K on Google ads since her launch. 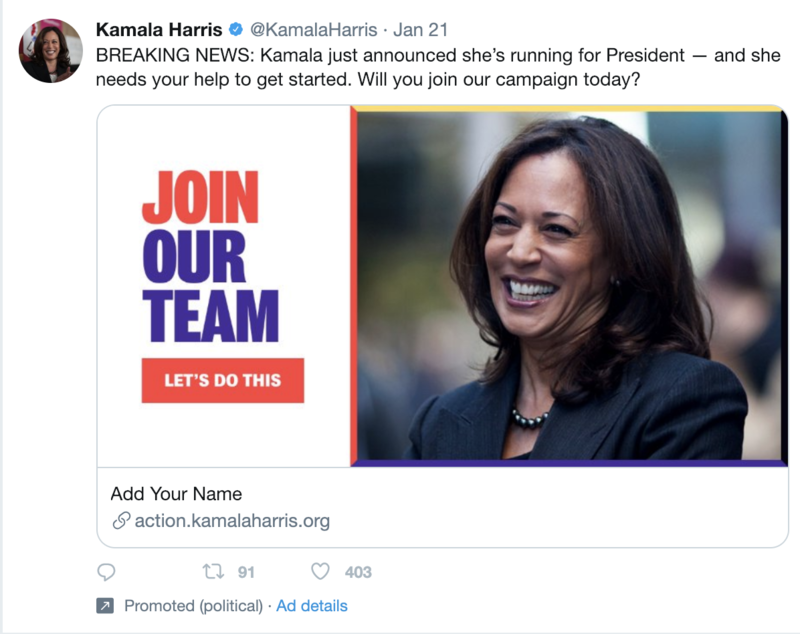 Harris made the initial launch announcement on Good Morning America, but that wasn’t the only way she leveraged traditional media to start a national drumbeat around her candidacy and start to lay the groundwork with progressive audiences. Throughout the week of January 21 – 28, Harris also participated in an interview with MSNBC’s Rachel Maddow and held a CNN Town Hall in Iowa, which averaged over 1.9 million views nationally. Both events enabled Harris to reach key audiences simultaneously – progressive MSNBC-watchers (and potential donors), Iowa Democrats, and national CNN-viewers. We know that people live their lives both online and offline – so campaigns should function online and offline as well. 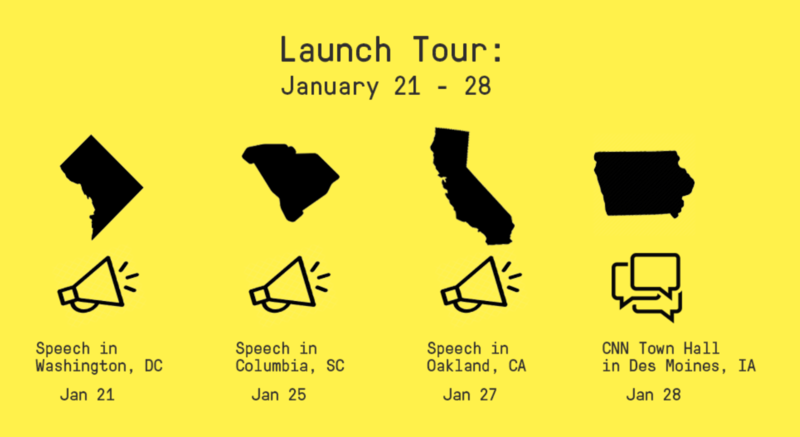 Harris’ campaign leveraged in-person events and opportunities to reach critical groups of voters in key states, and layered digital investment and earned media opportunities on top of the candidate’s schedule to maximize exposure and impact. Harris hit four critical regions in the first week of her campaign that highlighted key moments from her own background and underscored her commitment to reaching base voters in early-primary states: Washington, DC; Columbia, SC; Oakland, CA and Des Moines, IA. 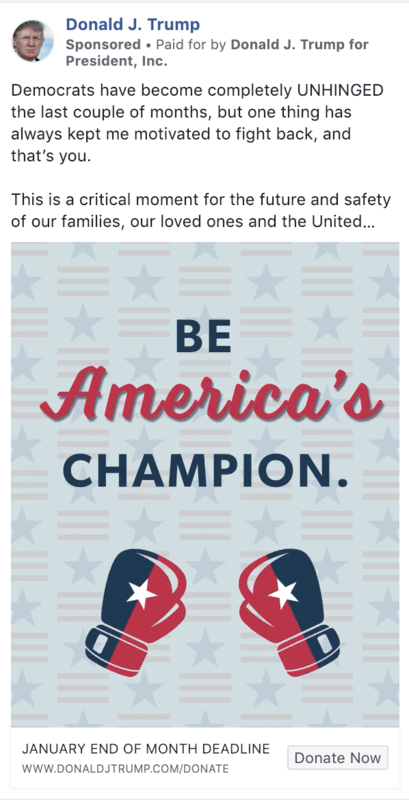 And by holding events like the CNN Town Hall in Des Moines, she was able to simultaneously show her campaign’s focus on Iowa and reach a massive national audience through CNN’s broadcast. In a crowded primary field, it’s clear that candidates need to use a multi-faceted approach to break through with voters – both in critical battleground states and across the country. 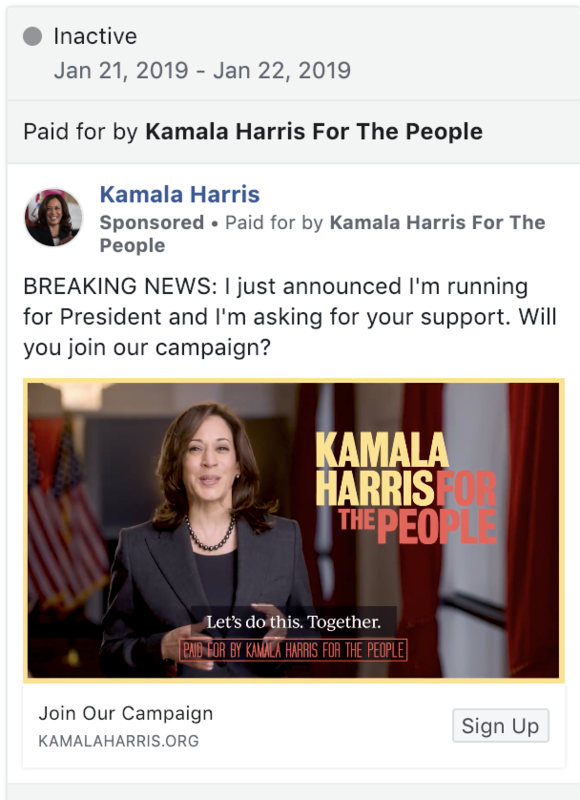 By using traditional political campaign strategies in partnership with digital paid media, Harris was able to drive sustained attention on her campaign launch and capitalize on a moment that can easily be forgotten in today’s media landscape.